After nearly 17 years at the helm of Vanderbilt Athletics, David Williams is ready for a new adventure. When the day ends on Thursday, Jan. 31, Williams will leave his office in McGugin for the last time as athletic director. On Friday, Feb. 1, Malcolm Turner will officially begin his tenure as AD. Williams will retain his role in the Vanderbilt Law School that he has held since 2000. During his tenure as athletic director, Vanderbilt Athletics has reached new heights on and off the field. Commodore teams have brought in four national championships, the football team has reached six bowl games and the men’s basketball team has made a few NCAA Tournament runs as well. However, Williams’ impact goes beyond the athletic spheres. Numerous student-athletes have lauded their personal relationships with Williams and how he has impacted their lives. In his final week as athletic director, Williams sat down with The Vanderbilt Hustler to reflect on his career and what the future holds for Vanderbilt Athletics. Cutler Klein: All of your stuff is in boxes and labeled. This is your last week in this office. What are your emotions as it all becomes a little more real that your tenure as athletic director is coming to an end? David Williams: As you start to pack stuff up, you come across stuff, not that you had forgotten, but maybe you haven’t remembered that day. You kind of re-live all of the things. It’s a situation where you’re having to move forward, but you’re still having to finish up. Thursday is the last day. I guess you just try to think about, to a certain degree, where do you go on Friday? What do you do on Friday? I never really have thought about what I’ll do tomorrow until I have to look at it and see. On Friday morning, will the car automatically drive over here? Probably not, but anything like that is bittersweet in the sense that it’s time to move on. You think about all of the things that have gone on, and you see them as you pack stuff up. It was interesting because today, one of the things that I just packed was a thing that we had that goes all the way back to Kwane Doster, who played football for us, and when we went to his funeral. And you remember that, and at the same time, it had something in it that talked about Turner [Cockrell] when we just went to his funeral. You remember those. In one of the folders, I saw a picture of John Norwood hitting that home run. You kind of just re-live some of those things. CK: Have you spoken to Malcolm Turner as he prepares to take the job? What advice have you given him about what he’s going to be undertaking when he starts on Friday? DW: We’ve talked a number of times. We’ve had some regular setup meetings where we talked, and it’s been sort of me trying to make myself available to answer any questions that he may have. Of course, some of it is specific things, and other things to give him sort of a flavor. I’m not sure that I’ve given him any advice, I’ve tried to just make sure that he understands or has a good picture of what I’ve felt the important things were. I would say that is the level of a number of things, one is the focus should always be, and I hope ours has always been, on the student-athlete. The second thing is we’ve always tried to do everything that we do with a high level of integrity and respect. I think you have to kind of find your way in that. The other things we’ve talked about have been more specific things like ‘what about this program, and what about that?’ We’ve had a number of talks, and we’ll probably continue to have some. CK: Looking back on your tenure here, what is the accomplishment, on the field or off the field, that you are most proud of? DW: I think it all sort of wraps itself into one big ball. I think a lot of people would think that the answer would be four national championships since we hadn’t had any before. When I look at us and I look at the rest of college athletics, I do think that we have stretched ourselves in a positive way, and we should stretch more, as it relates to trying to provide a college experience for the student-athlete outside of playing the game and going to class. I would say the internship program, study abroad, the MLK Day, the Soles4Souls program, those sort of things I think overall that I’m most proud of in the sense that we stretched that and put that into place. I think if there’s one item that really I got, I just think it’s so important, I always try to take the position sometimes you have to be able to do what you can do. I do believe that our leadership and Athletics’ leadership in sort of repairing the broken relationship with Perry Wallace has to go down as something that probably is not monumental to anybody outside of this, but to me, it’s very important. That relationship never should have been broken, and that relationship could have remained broken. As I was collecting pictures, I saw the picture that has Perry when he got his number retired. I still remember the crowd giving him a standing ovation. It wasn’t that far before that just wasn’t there. I would say being able to pull that off and lead in that is extremely important. CK: What do you think the biggest change has been at Vanderbilt and in collegiate athletics as a whole from when you took the job to now? DW: As it relates to how people perceive Vanderbilt Athletics, Vanderbilt is not an afterthought. In other words, we are to be reckoned with in all aspects. We are to be reckoned with on the field, and obviously academically. We will out-recruit you, we’ll outplay you and we will be take better care of kids and kids will want to come here and parents will want them to come here. That’s one. As far as college athletics as a whole, I really think college athletics is in a situation where it’s having to deal with what I would call an issue of social justice. A lot of people don’t recognize that, but I think what you see in the law cases, what you see in the whole transfer rules, what you see with the increase in the cost of attendance, even so much as last week at the NCAA meeting where the autonomous group voted 80-0 to increase the amount of resources in mental health for student-athletes, is really something that’s about social justice. I think that we in athletics need to understand that going forward, the issue of social justice and how we are in an endeavor, especially the 65 universities that are in the autonomy, are bringing in a lot of money and we need to make sure that our facilities are good, our coaches are paid well, but at the same time, these student-athletes are getting the best possible experience they can get. CK: Do you have any regrets from your tenure, or things you wanted to accomplish, but weren’t able to get done? DW: Every day, you go home and you think you could have done something better on that day. Those things are too numerous to list. I would have liked to have been able to take us up to 20 sports. I really wish we could have been and I could have gotten us to the point where we could have expanded and brought in maybe three more sports. I think that would have been a right size for us. I think 20 sports is a right size for this university, and I regret that we never could move up to that. I think between women’s softball and women’s volleyball, we need to have at least one of those, and maybe both. I would have loved to see us add on men’s track, I think that would have helped our football program, and it would help our men’s cross country program. Personally, I would have liked to see us add fencing. But I would have liked to see us add three sports. CK: Did you ever think about adding hockey given the growth of the Predators and the growth of college hockey in general? DW: Yeah, and it’s funny that you should ask that because I’m from Detroit, and I grew up with hockey down the street. I went to Northern Michigan University, at the time when Northern Michigan was one of the few universities that had a college hockey program and actually were national champs. It was maybe a month ago that I sat down with some people who are actually trying to get that done. I don’t think I thought about that until maybe about 18 months ago, but yeah I do think the future of bringing college hockey here is something that really needs to be looked at. CK: A couple of years ago, you had talked about things that were necessary for the football stadium in terms of renovations and in terms of just trying to bring that stadium into the modern era. It hasn’t worked yet due to a multitude of factors. Do you have any regrets about not being able to get that done, and do you think that’s something that Malcolm should be looking at? DW: Yes, I do think Malcolm should be looking at it. We’ve talked about that. It’s not a matter of regret. Obviously, if we could have got to that, fine. I always have to say okay, what would we have had to give up to get there? And realizing what I think we would have had to give up to get there, no I don’t regret it. The timing wasn’t there. There were other things, and I know some people might not like to hear this, but there were other things that were just more important. And the way in which we finance ourselves and the amount of money that we were able to raise, it just wasn’t in the cards at that time. Its time will come. Malcolm and I have had some real discussions about it, and I kind of told him I think that’s something that needs to be on his radar, and I think it is. It just wasn’t in the cards for the 15 years I was running the program. CK: When you announced that you were retiring back in the fall, a lot of student-athletes talked about the close personal relationships that they’ve established with you and what that has meant to them. How important was that to you to be able to be a personable face to the student-athletes and to have that one-on-one individual relationship with the student-athletes that come through here? DW: That’s probably the most important thing. Years ago, when some of the students asked me why I do this, it’s about them. It’s funny because today I was over on the other side of campus and one of our student-athletes was getting out of class, and we stopped and talked, and then another one came. It was interesting because I wasn’t in the athletic world, and neither were they. They were in the student world and then as I came back across campus, I saw another one of our student-athletes and his dad. They stopped to talk. I’ve gotten a lot of emails and calls from former student-athletes. I would say that is probably the most gratifying thing, the personal relationship. That’s another thing I’ve talked about with Malcolm. I think that the thing that I will miss the most is the relationships and the friends, not only on the staff but the kids that come through. To see that period of time, and I always tell the story of the Saturday before the football season started this year, I woke up that morning to a text from Jordan Matthews and his wife, and they told me they just had a baby boy. We ended that day, my wife and I, at the wedding of Vince Taylor. These were two guys that played football for us, and they don’t play for us anymore, but the relationships are still there. I see Brandt Snedeker all the time. I’ll see Sydney Campbell, she sells real estate now. Those are the ones that are just most important. I just can’t think of them all. Simone Charley was back here from being in Portland, she came up, and we talked about her one day going to law school. When I was in D.C. in December and we did a program, Charlie Jones, who used to play tennis for us and then went to law school, came to the program. I’m going to miss that. CK: Looking at the coaches you’ve brought in over the last five years or so since Derek Mason was brought in (Bryce Drew, Stephanie White, Darren Ambrose), a lot of those coaches have tried to establish a new culture here and getting high-level talent to buy in to building that culture. Do you see that as kind of a common quality of the coaches that you’ve brought in? DW: Yeah, and I think that those coaches, they play off of each other. You can go back and you add some that came in just before that group in Scott Limbaugh, Greg Allen, but I think it’s very important to point to Tim Corbin, Geoff Macdonald and John Williamson. They’ve been here the whole time, and they basically have shown them that you can do it here. You can win here, you can bring those kids in. The great part about the coaches here is that they all get along with each other. They like each other, and they help each other. The great part of it is when one of them is having a problem and things are going tough, I don’t have to reach out to the other coach and say ‘Hey, why don’t you talk to so-and-so.’ They do that. I think that helps a lot. I’ve been really happy about the fact that the concept of culture has been developing, but I think that’s the only way you’re going to be successful here. If you’re coming here and you’re not going to do that, you’re not going to be successful here. Every one of them will have their own piece of it, but the fact of the matter is there’s a great culture here and there’s a culture of family and we’re going to help each other and we’re going to do well, and we’re going to have fun doing it. CK: What do you think Malcolm Turner’s biggest challenge will be when he takes the position on Friday? DW: It’s both a good and a bad thing: expectations. I think that when I came in, I was fortunate in the sense that I think from a lot of people, the expectation was lower. We’ll beat you on your bad day or we’ll hope you’re looking the other way. I think the expectations are pretty high, and that’s exactly what we wanted. I think that he will just have to deal with those expectations and I say it as it’s hard not in the sense that I think he’ll have a hard time meeting them, but I do think that from 15 years ago, the expectations of this department in all different ways are much higher than they were on the field, in the classroom, what we do socially, all of those. The expectation, even at the SEC, is that we’re going to be the ones that will stand up. Our whole new transfer rule that allowed graduate transfers within this conference to not have to sit out a year was because we kept drilling it. Even at the point where a lot of the ADs that at first weren’t for it, slowly but surely came around. Then the presidents came around. That’s who we are, and everybody knows that. I think just filling that level of expectation is something that I don’t think he’ll have a hard time doing it, but I think that’s going to be the big hurdle. CK: You got to go home to Detroit for the Vanderbilt Achievers “I Never Left” documentary. What was that like to be a part of that and reflect on your roots a little bit? DW: That was pretty cool. They’ll tell you I didn’t want to do it. I was like ‘Why are we doing this? Why are you guys doing this?’ I do get to go back to Detroit a number of times, but it’s sort of like going in for something and coming right back out. This was something that, because of what they wanted to shoot, I had to go back down memory lane. As many times as I go back to Detroit, I don’t think I ever go back by my old high school. I’ll go back down the street from where I went to elementary school only because my daughter lives around the corner there, but I never go back to that school. We did those things, and it brought back some real interesting memories and sort of reinforced to me where much of my value system came from. It was emotional, but it was fun. I give them a lot of credit. They did something that if it had been left to me, never would have been done. That taught me something also. People have a lot better ideas than I do. CK: You won’t be fully absent from campus, but what are you most looking forward to about retirement? DW: Actually teaching. I’ve always enjoyed teaching, and I’ve always felt guilty over the last few years because even though I continued to teach, I always say my teaching, I referred to it as drive-by teaching. I run in the classroom, and I might get there just as class is starting, and then I’m gone. I never get to sit around and talk to the students like I used to before I became an administrator. Even now, as I’ve started to move stuff over to my law office and just sit in there, I feel sort of like a fish out of water because nobody knows that I’m there. The whole gamut of what teaching means, not only in the classroom but interacting with the students, and actually exploring some of the ideals from a research point of view. And then the other part is I hope to spend a fair amount more time giving back to the community. CK: When people look back on the David Williams era of Vanderbilt Athletics years from now, what do you hope your legacy will be? DW: Legacy is a funny thing for me. I’ve never really been into that. I really think my legacy will be my kids. If you have to put something on the department, and what we did, I sincerely hope that when they look back, they’ll say all of the things he was responsible for doing, we did better. I think that if nothing else, it becomes the baseline. I don’t want it to be the record, because the record would mean we didn’t do any better. I want it to be that ‘Yeah, you remember back then when they only won so-and-so? We did this. They only made one trip to this, we did that.’ Everything that they do will be better, but the hope will be that it emerged from what we set as the baseline. CK: Now that you’re leaving the job, do you have any message or anything you want to say to the Vanderbilt Community as a whole? DW: Thank you. I’ve been fortunate that a lot of people have come to me and said thank you, job well done. I would just say to the Vanderbilt students, the fans, the faculty, the staff, everybody: the thanks goes to you all, not to me. Thank you. As your AD, Anchor Down. Another fine piece by Klein who will be missed when he graduates this year. Williams has been steady or better steadfast in the support of the student athlete and their coaches. 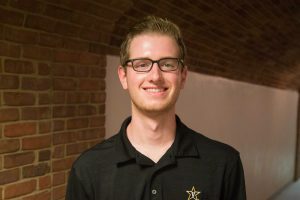 The community culture he has established in athletics extends to the entire Vanderbilt community and that interface of athletics and academics can be one of misunderstanding and lack of trust. Williams has seen to it that there was respect for athletics and the many wonderful men and women who represent Vanderbilt on varsity sports. 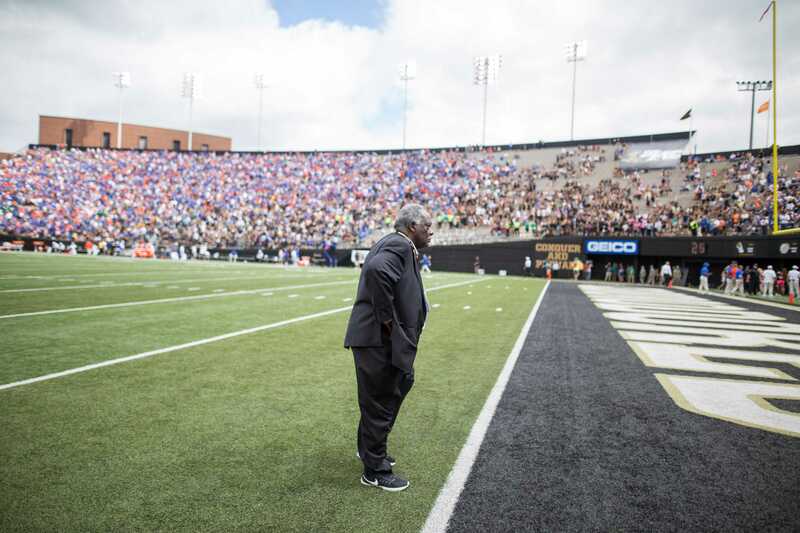 David Williams has made a major positive impact at Vanderbilt – thanks.